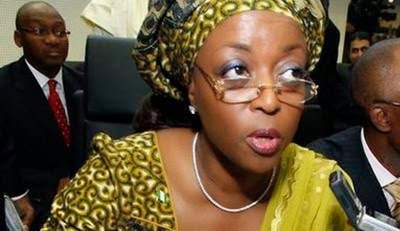 No fewer than six countries have already refused to grant an asylum request by the Minister of Petroleum Resources, Mrs Diezani Alison-Madueke, the Business Council for Africa (BCA) said in its just-released monthly report, noting that about US$ 1 trillion is the latest estimated figure of the looting of the Nigerian treasury between 1960 and 2005 alone. The report, dated March 2015, focused extensively on Nigeria’s general elections. It said the notorious Minister, whose impunity is known to have been closely-protected by President Goodluck Jonathan, will be coming under the microscope for the first time in her Ministerial career. “Given her reputation, it comes as no surprise to learn that 6 countries have already refused to grant her asylum to live in their countries as she now wishes to leave Nigeria at the earliest possible opportunity,” it said. BCA recalled President-elect Muhammadu Buhari lamenting that the rest of the world looks at Nigeria as the home of corruption, one where stealing is not corruption but a way of life, and that his administration will pursue all public offices and individuals who are believed to be guilty of corruption. “It will be very interesting to learn in the coming months exactly how far back in Nigeria's history his administration will go in the pursuance of those who have robbed Nigeria of US$ 1 trillion, which is the latest estimated figure of theft from the Nigerian treasury between the period 1960-2005. Given that President Jonathan's administration is considered the most corrupt of any of its predecessors, that figure is going to be considerably magnified, but whether the new President will wish to pursue former Heads of State is a matter of interest and considerable debate to Nigerian observers. It is this subject that is primarily responsible for Buhari's success in winning the election as well as his campaign promises to eradicate Boko Haram, revive the economy and rebuild Nigeria to make its position as the number one country in Africa.